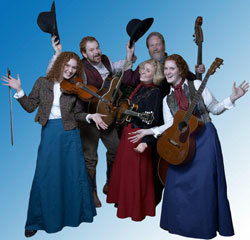 Get ready for family-friendly entertainment and a great show with the Horn family when you get to the Circle B Ranch. Your Circle B Chuck Wagon Supper and Music Show begins with cowboy movies and free, fresh popcorn as the Horn family begins making your meal. Good, old fashioned cooking will be brought to your table as soon as the food is ready. Seconds are served to make sure that no one goes hungry and then the show begins. Classic and contemporary cowboy music is sang by the riders and family of Circle B, and a special Irish tribute will be made featuring tunes from Ireland and cowboys in kilts. Meanwhile, pranks and comedy will have you laughing at the antics of the group and feeling like one of the family. 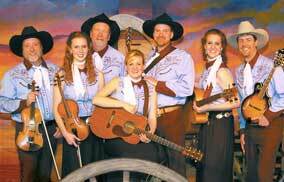 Hailing from Wichita, Kansas, the Diamond Wrangers will provide some of their own cowboy and country musical variety to the Circle B Chuck Wagon show. Your show still includes all of the traditional entertainment and meal, but it provides an extra performance with the talented Diamond Wranglers. 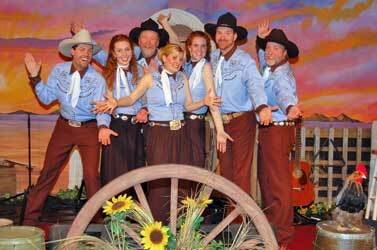 The Circle B Chuck Wagon will add delightful decorations and holiday songs to their Christmas show, helping you get into the spirit of Christmas. Sing along with them as they strum classic carols and dance to traditional songs. Loved this show! The food was wonderful, the service was warm and friendly and the entertainment was outstanding!! I would recommend this show to people of all ages!!! "Was fun and a nice evening." Was fun and a nice evening. Had hoped the show would have been more interactive. It was a very, hands on supper and music show. We thoroughly enjoyed the meal and entertainment.